The bone structure and tissue of our cheeks play an important role in beauty. A healthy amount of fat in regions, such as the midface and cheek, imparts a sense of youth. With aging, there can be a loss of fat in key areas which can create a hollow and aged look. Volume loss can occur in the midface or cheek area, under the eyes (tear trough), around the eyes (orbital rim), smile lines, and temple. There are now face & neck procedures to replace volume loss in the face, creating a more rejuvenated and refreshed look. Fat Transfer is a surgical procedure which restores the lost fat with your own body’s fat from another area. Dr. Harirchian most commonly harvests the fat from the inner thigh, outer thigh, or lower abdomen. Studies have shown that 30-40% of the transferred fat persists at a few years. Therefore, fat transfer is semi-permanent and has long lasting results. Fat Transfer can be performed as a surgical procedure alone, or with other procedures. It is typically performed under twilight anesthesia or deep sedation. The face is evaluated before surgery and the areas of volume loss are marked. Areas which can be treated include the cheeks, midface, around the eyes and brow, smile/laugh lines, frown lines, temple, and lips. During surgery, Dr. Harirchian gently liposuctions the donor areas of fat, most commonly from the inner thigh, outer thigh, or lower abdomen. The donor fat is then gently purified and processed to produce the best fat for injection. Dr. Harirchian then uses microcannulas for precise fat injection into select areas. 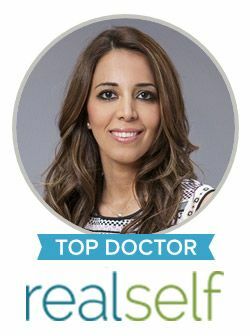 Dr. Harirchian is conservative with fat transfer to ensure natural results and to avoid the “over-injected” and puffy look. It is important that the fat is processed correctly during surgery to avoid lumpiness and to ensure that the fat that is transplanted survives. Contact our office today to schedule your consultation with Dr. Harirchian about facial fat transfers. On this patient, Dr. Harirchian performed a fat transfer procedure with fat grafting to the cheeks, under the eyes, above the eyes (brow area), and laugh lines. The patient also underwent an upper eyelid (blepharoplasty) procedure and fractional Co2 laser resurfacing.